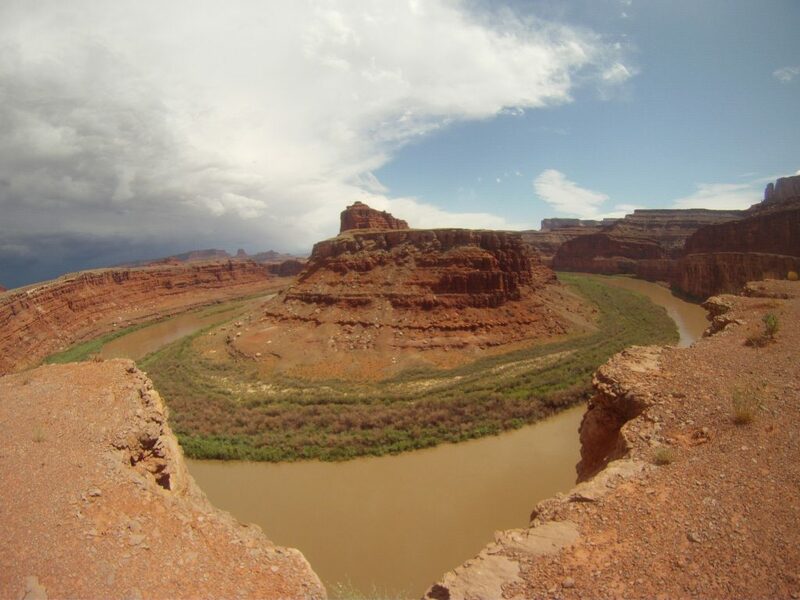 This view is more commonly photographed from dead horse point. But from the shafer trail you are much closer. Flood after 2 minute rain storm. We mad a car pass us here as we did not wanto to be the ones on the outer edge. Me and Erik in our rig, shot this with my go pro! When I first heard the song “Wandering” from Johnny Cash I knew it was for me. That desire to wander has caused many explorers to find. In some cases high hopes were dashed as disaster was found, however more often than not when wandering many explores have found something incredible. After biking a few trails, we had planned on rafting the Fisher Towers section of the Colorado River. My sister a 15 year river guide suggested that the 42 degree water without a wet suit may be a bit too cold even for her two snow loving brothers. For some reason what seemed so inviting in the morning now just didn’t feel right. We listened to the feeling and our sisters warning. 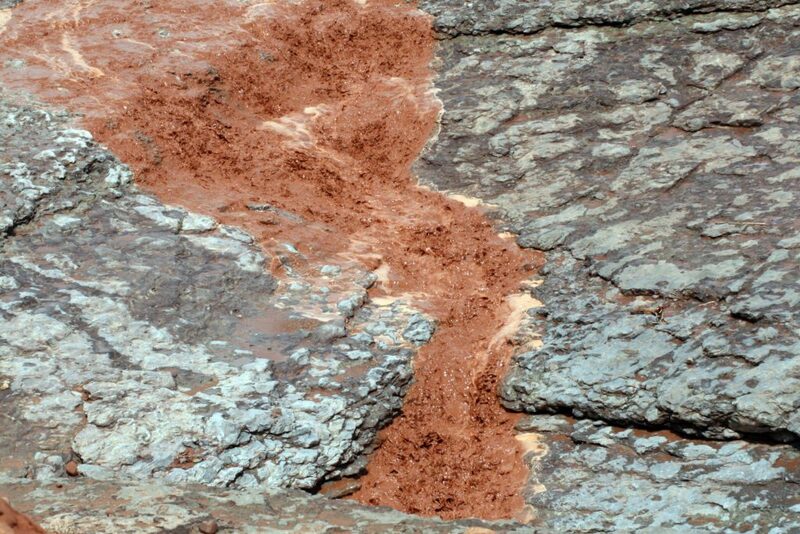 Brenda said there were Indian petro glyphs up the potash road. So just after the famous Moab tailings pile we hung a left. The sheer sandstone walls that guarded the canyon on either side were something to behold. Many climbers were in the process of scaling the cliffs on the shady side of the canyon. Their observers and belayers laying on the side of the road so relaxed their heads were encroaching upon the white line on the right side of the lane. Failing to see the sign for the petro glyphs we found ourselves looking at the Ultra blue water in the Pot Ash settling ponds. Apparently they add blue die to help the water evaporate faster. Ultimately they are trying mine pot ash. I am not sure what pot ash is used for but apparently they want it. Driving to the crown of the hill we stopped to notice the beauty of the results of a passing rain storm cascading off the nearby sandstone cliff. Suddenly rain began appearing on our trucks windshield. The rain picked up and really started pouring down, puddles met each other quickly becoming small streams, then it really let loose it was really coming down and somehow it seemed to instantly go from really letting loose to an unbelievable amount of water gushing down upon us. As hail mixed in we both instinctively ducked our heads even though we were covered from the elements and Erik pointed his truck for the shelter of a nearby sand stone formation. The storm lasted maybe 2 minutes, but in those two minutes every drainage in the area became filled to capacity with red slurry like water. I wondered which slot canyon would soon fill with the slurry or what cliffs would soon be joined by a fantastic water fall and how far away these events would be from our location. After crossing a few of these temporary rivers and few more miles down the road incredible desert vistas with a soft shifting light caused from the over cast skies welcomed our eyes. In fact the road passes by the same views found from the fabled Dead Horse Point only a few miles away. 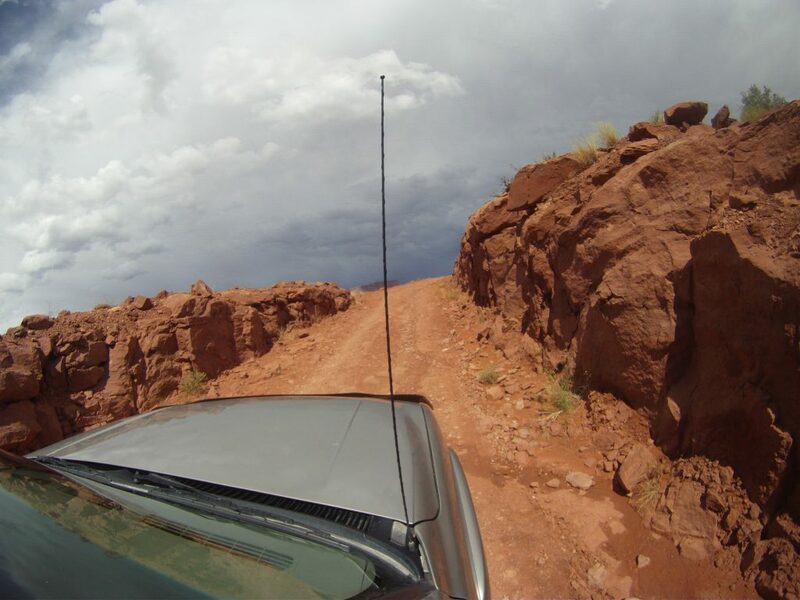 It would not be long till we saw a sign we did not except on such a remote dirt road that read “Entering Canyon Lands National Park”. We would find out later that we had wandered onto the famed “Shafer Trail”. 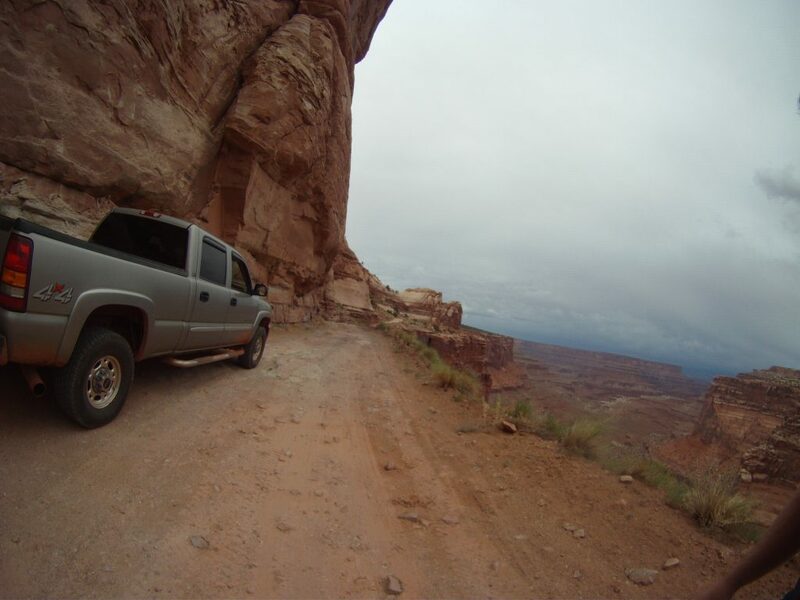 Soon we found ourselves driving down part of the white rim trail toward Muscle Man arch noticing the time of day we switched directed toward the Island in the sky section of Canyon lands National Park. To get there we would need to follow a narrow switch back road 6.8 miles ascending around 2000 feet. This road is not for the faint of heart. If one is afraid of heights I’d recommend staying as far from here as you can. My guess is that people have died as their cars or bikes plummeted off the side of the road. 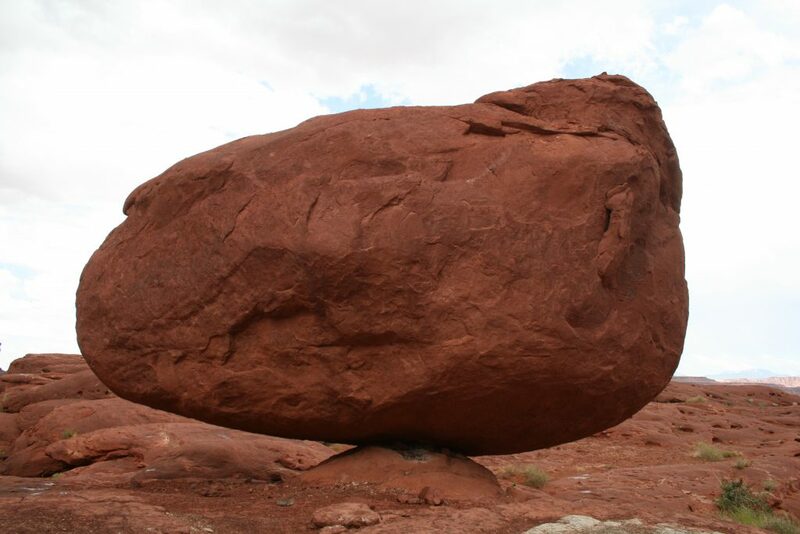 At one point the road is actually suspended atop a sandstone overhang, yup one wrong move and its curtains. The view is certainly breathtaking in more than one way. I must admit that we saw a car coming down the road and quickly decided we wanted to be the inside vehicle far from the edge. It appeared they had the same idea, so I popped out of the truck with camera bag and tripod to appear that we would be there for some time. This appearance ended the stale mate and it was obvious that the lady passenger was on the nervous side of life as they squeaked past our truck. But as Erik had said “they are going to pass me on my terms” and they did. Despite our location in relation to the edge of many tall sheer cliffs I was able to fully enjoy a new camera I got. It’s called a Go Pro, and so much fun! You can pick one up for as little as 250 dollars. They shoot 5 mega pixel pictures @ F 2.8 @ 170 degrees! They also shoot 1080 p HD video. They only weigh approx 3.3 oz and can mount to just about anything. Atop the “Island in the sky” the view of the imposing LaSalle Mountains was spectacular. 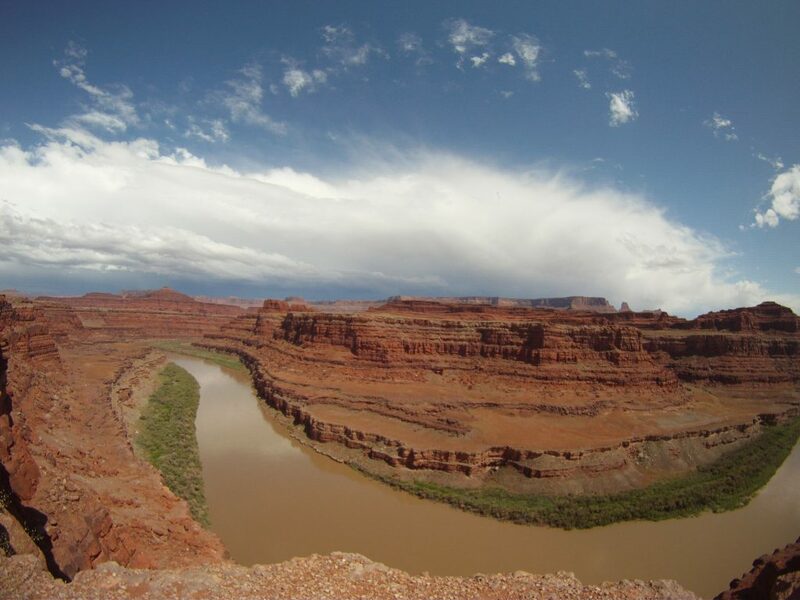 We found we very close to places like Upheaval Dome, and Dead Horse point. We soon wound down the much tamer paved road toward Moab. What a trip it had been wandering. At the beginning we had no idea how spectacular it would be. Sometimes you’ve just gotta point your rig in a direction and see what’s over the next ridge. 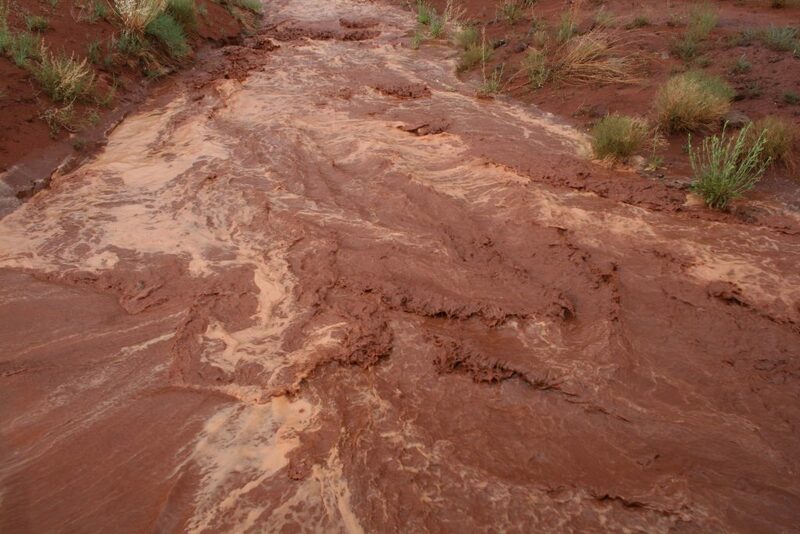 Sadly we later learned from my sister Brenda that we had made a wise choice in avoiding our rafting adventure. A man who apparently did not have a wet suite fell out of the river in the exact section we would have been in and died of a heart attack. I am glad we did not have to view that sad situation or be part of it ourselves. In short, in your wanderings make wise choices and listen to that inner voice that sometimes warns of impending disaster. I hope to always be humble enough to say hey guys for some reason I just don’t feel right about this, I‘m out. Then maybe my wanderings will find incredible things. May all of your wanderings find the incredible and be safe in so doing.